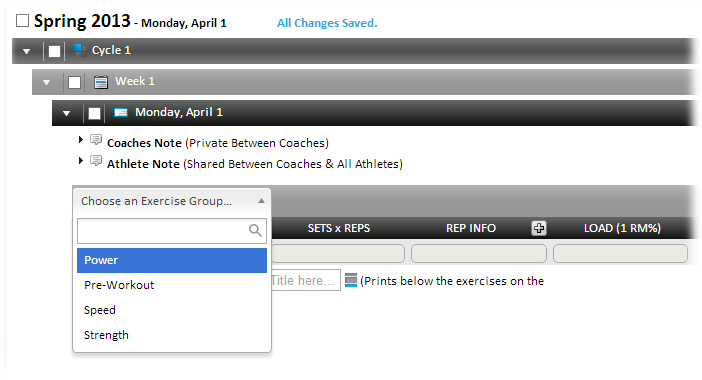 Exercise Groups – You can now separate Exercises within Workouts through the use of Exercise Groups. Each group can be given a unique name to categorize the Exercises performed during a Workout session. These Exercise Groups are printed on strength cards and display on PowerTracker touch screens. Enable these groups by selecting “On” for Exercise Groups when creating new Workouts. Once a Workout is created to use Exercise Groups, the Workout cannot be changed to disable them. Likewise, Exercise Groups cannot be enabled for existing Workouts. The Workout designer is updated to show Exercise Groups, which include drop-downs at the top so you can quickly give a name to each group of Exercises. Each Exercise Group visually separates the Exercises in the Workout designer, giving you a clear picture of your athletes’ workout. 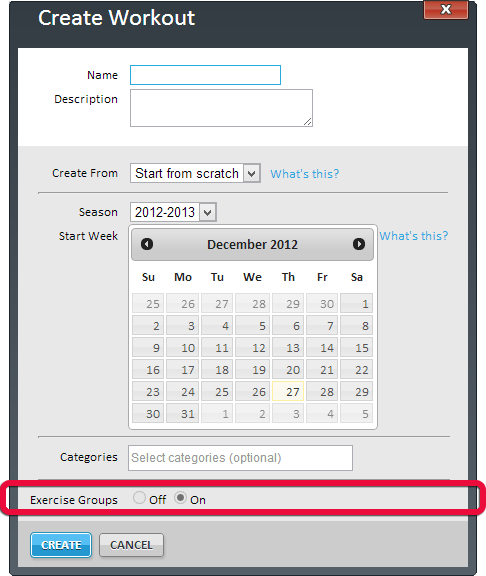 As each new Exercise Group is added, a new blank group is automatically created beneath it. Making a new group part of your workout design is as easy as selecting a name for it. 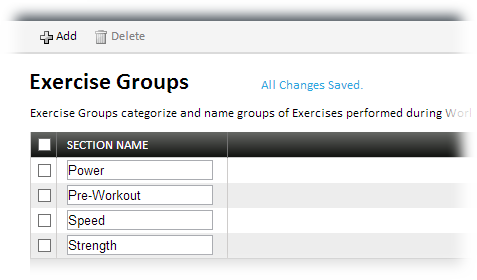 Exercise Groups are created, renamed, and deleted from the Exercise Groups page (accessed from the Team Setup menu). 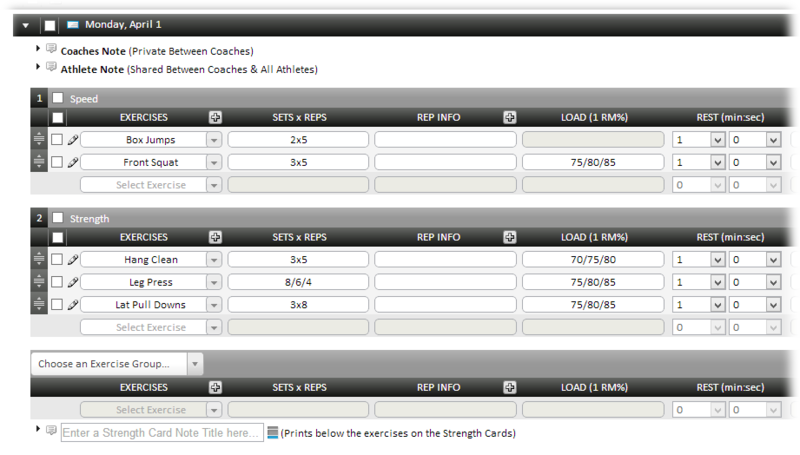 They can also be created in the Workout designer by entering the name and clicking “Create new Exercise Group”. Exercise Groups maintained from the Team Setup menu. Exercise Groups created on a Workouts page. 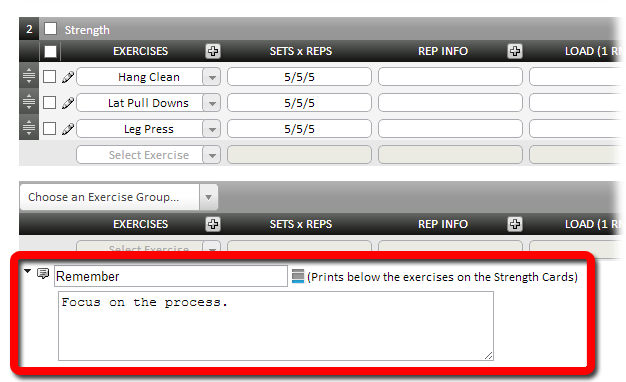 Existing Exercises can be associated with groups in the Exercise Groups column on the Exercises Team Setup page. When you create new Exercises you can associate them with Exercise Groups in the Add Exercise box. By associating Exercises with Exercise Groups, Exercises are grouped accordingly in the Exercise drop-downs of the Workout Designer. 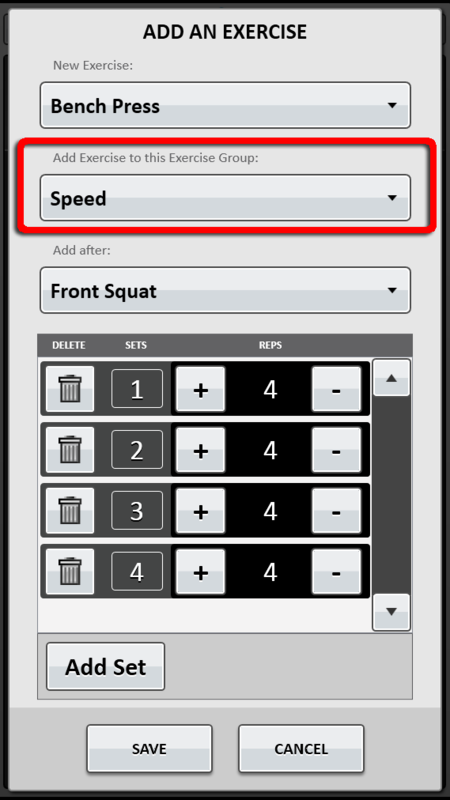 This makes the creation of Workouts more efficient by making it faster for coaches to select the right Exercises. The Exercise Groups created in your workout designs carry over to the strength cards printed for your athletes. Each group stands out so your athletes can quickly see the intent of the included Exercises. Renamed Group Buttons – To better represent their intended purpose, the Group and Ungroup buttons on the Workout Designer tool bar (used to create supersets in Workout designs) are renamed to Create Superset and Undo Superset. 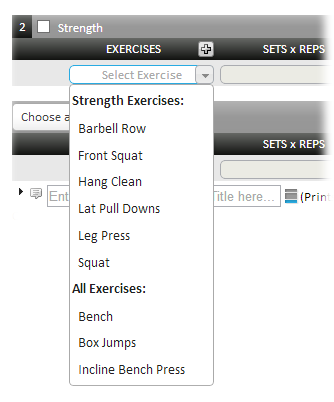 Although the names are changed, the functionality remains the same: When multiple Exercises are selected, the Create Superset button becomes active so you can create a superset. When an Exercise that is included in an existing superset is selected, the Undo Superset becomes active so you can separate the Exercises. Previously, the buttons used to create supersets were named Group and Ungroup. The buttons are now renamed to Create Superset and Undo Superset. 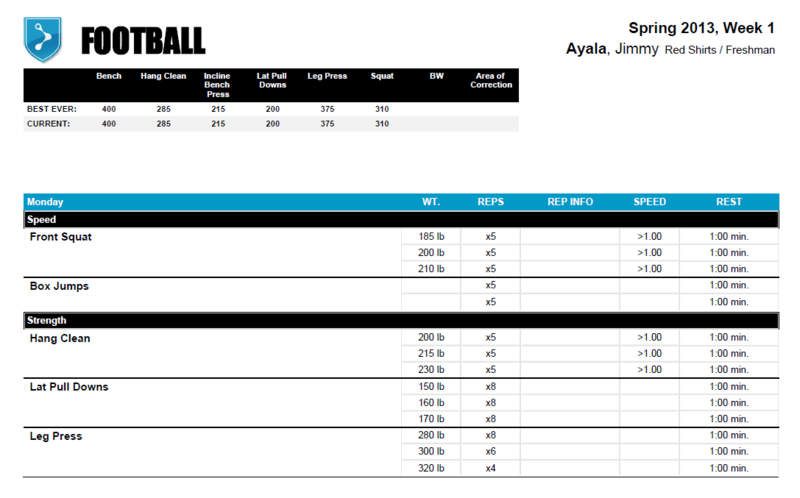 Custom Strength Card Note Titles – You can now add customized titles to the Strength Card notes you create in the Workout Designer and that print on strength cards and display on touch screens. Create your Strength Card Note with a title in the Workout Designer. The Strength Card Note title is printed along with the note on strength cards. Exercise Groups – If you build your Workouts using Exercise Groups, these groups are displayed on the touch screens directly above their prescribed Exercises. 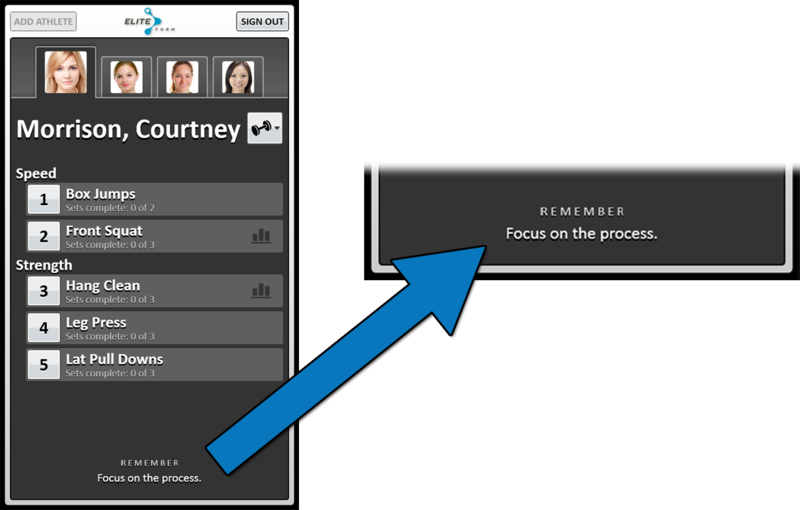 Additionally, Exercises added using the touch screen can be assigned to Exercise Groups. 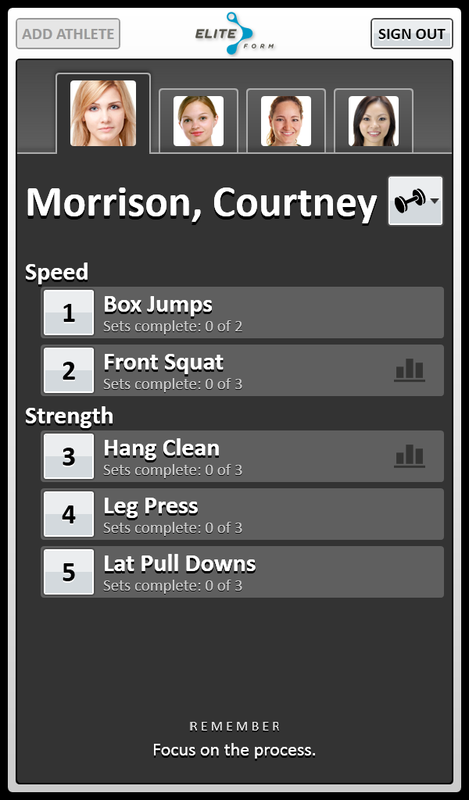 Strength Card Note Titles – If you created a Strength Card Note with a title in the Workout Designer, it is displayed on touch screens.